The eyes of Sunday football-goers have been on more than just the game since the start of this NFL season. Widespread national anthem protests by players in response to racial injustices in the United States have sparked controversy across the nation, polarizing fans in their reactions. Beginning with a smattering of anthem protests in preseason games of 2016, the phenomenon grew exponentially in response to a twitter diatribe from President Donald Trump, pinning the protesting players as unpatriotic and calling for them to be fired. The movement began with former 49ers quarterback Colin Kaepernick sitting – then kneeling – for the national anthem before preseason games in 2016 in protest of police brutality and racial inequality in the U.S. Similar protests by small groups of players occurred throughout the season, but most were isolated incidences that garnered little media attention. They were also widely unpopular; Kaepernick himself has yet to be hired coming out of last season. However, the 2017 season saw a huge increase in the number of protests following President Trump’s scornful response on twitter. The weekend before Trump’s onslaught had seen a mere six NFL protests. The following Sunday, the New York Times reported around 200 players sitting, kneeling, linking arms, or raising their fists in demonstration during pre-game national anthems across the country. The use of the NFL as a platform of protest has been pointed and loud. Sunday football has been a staple of American culture for decades: a collective weekend activity that unites in both ritual and competition. Millions of Americans watch every week, whether it’s through filling stadiums or just filling their couches. Players are icons of this culture, idolized by everyone from casual Sunday fans to Fantasy Football fanatics. Given the viewership of the NFL and the cultural status of its players, it’s no wonder that some took to this national pastime to publicize their discontent. It’s also no wonder that national controversy arose when this cultural arena became a political one. The President’s response all but matched the protests in amplitude. At a rally in Huntsville, Alabama on September 22nd, Trump loudly publicized his stance by directing anger – even profanity – at the protesting players. In a four-day span directly after the rally, he published a grand total of 21 NFL-related tweets, calling for everything from the firing of demonstrators and changing NFL policy, to a total boycott of the industry. The centre of his argument: the disrespect of the country, its flag, and most notably, its military. Using military service as a heavy object to wield for political gain is disdainfully commonplace in American politics. Democrats and Republicans alike are guilty of consciously using veterans to add integrity, whether they are utilized as campaign “props” or as credible padding for the cabinet. In this instance, Trump tweeted “Courageous Patriots have fought and died for our great American Flag – we must honor and respect it!” Not only does this show him playing the game of political credibility to back his claim, but he also calls upon the nationwide feeling of guilt: the fear that every American has of disrespecting the brave men and women who die for their country. To this end, Trump manipulates the honour that the American veteran holds in a clear attempt to shame the athletes. While clear, the attempt was also misguided. Not only is his claim largely reductionist by condensing the views of all veterans to appear to back his own, but it misses the point of the demonstrations. 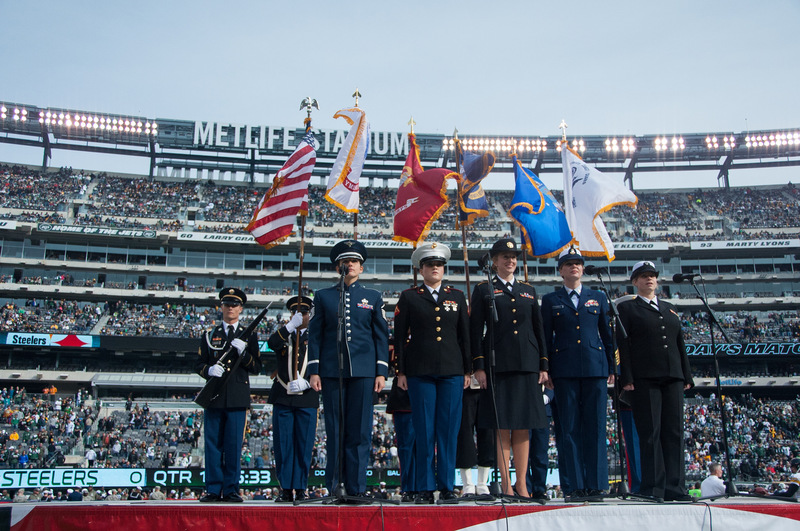 The military is simply not the target of protesting the American flag and national anthem. It is true that the citizens, in showing respect to the nation, show respect for the flag. It is also true that the military, in serving the nation, also serve the flag. Yet, this relationship of respect does not flow both ways: the flag is not representing the military; service in the military is representing the flag. The flag represents America. Therefore, protesting the flag does not inherently mean protesting the military; in this case, it means protesting America and the American ideology. While the community might not change much, America as an ideology is always shifting, whether it be a result of social pressures, external events, or the current administration. Nationality did not mean the same under the Obama administration as it does under Trump. One can acknowledge that there was a shift in that ideology a year ago when Trump was elected, but the degree or dynamic of that shift is subject for debate. The one “true” American ideology – what it is or what it should be – is personal. The NFL protests were aimed at that ideology. They were not aimed at the community, nor the veterans that protect it. By protesting the flag and the national anthem, the players were protesting the ideology that they represent. The athletes were protesting a flag that they saw to represent racial inequality, an American ideology that did not align with their vision of what it should be. While many Americans see their protests as un-American by rejecting “American” values, the protesters can also claim that the current administration is rejecting the true “American” values, so they are the ones that are un-American. The recent NFL protests just highlight one of the main struggles of the current administration: the Battle of the un-Americans. Lilla Adams is a U2 Political Science student at McGill, double-minoring in International Development Studies and Communications. Lilla is a U2 student currently pursuing a degree in Political Science, with minors in Communication Studies and International Development. She specializes in North American/European politics, political theory, and media in politics.